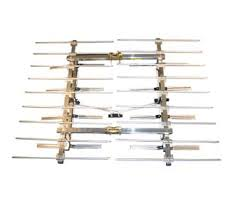 Winegards premier 8-bay bowtie antenna, perfect for long distance, narrow beam TV reception. Product arrives collapsed in long box, some assembly required. The ability for the HD-8800 to be shipped in collapsed form makes it a great antenna for an attic installation. • This is a Large Directional antenna and yeilds a beam width of about 20 degrees. • Turning Radius: 23 in.